Troops have adopted the phrase "assaulting forward"
American military uniforms feature the U.S. flag, which is worn facing backward. The rule is that the blue field of stars should always be in the highest position of honor on the uniform. That position has always been the right shoulder with the flag's blue stars facing forward. The place of honor for the American flag is always to the right of other organizational flags like the USMC or Navy flags. When carried with an organization flag as in the March of the Colors, the U.S. flag is carried to the right of the line of march. The organizational flag may be dipped in salute to the reviewing officer at a parade or during the National Anthem, but the American flag is never dipped in salute. Army Regulation 670-1, Wear and Appearance of Army Uniforms and Insignia, is the governing authority for how Army uniforms are worn. Specifically, paragraph 28-18 governs the wear of the U.S. flag on Army uniforms. 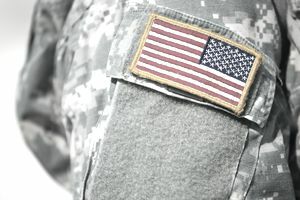 Specifically, the regulation states that: "all soldiers will wear the full-color U.S. flag embroidered insignia on utility and organizational uniforms unless deployed or in a field environment. Soldiers will wear the subdued tactical flag insignia while deployed or in a field environment." The subdued tactical flag worn on deployments or in the field features muted colors. Basically, the idea behind the backward American flag on Army uniforms is to make it look as though the flag is flying in the breeze as the person wearing it moves forward. During the Civil War, both mounted cavalry and infantry units would designate a standard bearer, who carried the flag into battle. As this standard bearer charged, his forward momentum caused the flag to stream back. Since the Stars and Stripes are mounted with the canton closest to the pole, that section of the flag stayed to the right, while the stripes flew to the left. Therefore, the flag is worn on the right shoulder, and wearing it backward gives the effect of the flag flying in the breeze as the wearer moves forward. In 2003 the uniform regulation for the Army was updated. Army Regulation 670-1, “Wear and Appearance of Army Uniforms and Insignia,” addresses explicitly the proper and lawful placement of the U.S. flag patch on the Army uniform. The regulation states that the stars are to face forward. When authorized for application to the proper uniform the American flag patch is to be worn, right or left shoulder. One of the flags will, therefore, be reversed (right shoulder) in order to adhere to the regulation and custom of having the stars facing forward. The term, “Assaulting Forward” has been adopted by combat troops (instead of "facing forward"). The appropriate flag (color or subdued) for the right shoulder sleeve is identified as the reverse side flag. The flag became a mandatory uniform component at all times in 2005. Chapter 1, Title 4, of the United States Code, provides for the design of the U.S. flag and specifies the colors as red, white, and blue.